This document describes how to install, and operate the Premium Sound System, as fitted on the EF/EL Fairmont Ghia, DF/DL LTD, and optional on the NF/NL Fairlane Ghia Models. 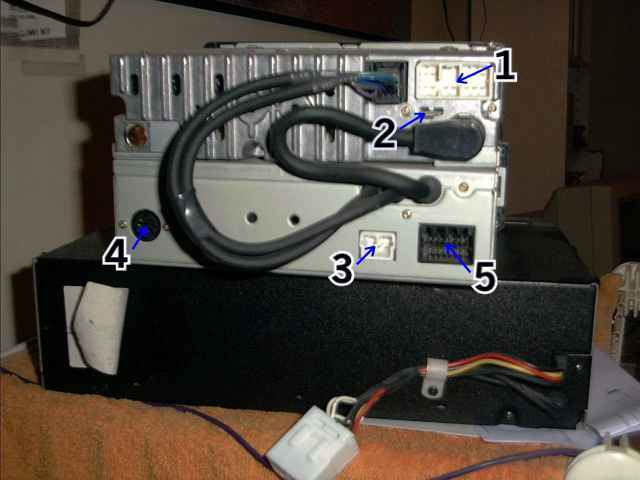 This includes wiring the CD stacker, the standard or optional amplifier, speakers, and the Head unit itself. EF/NF/DF Models were fitted with a dark grey (SLATE) model. EL/NL/DL Models were fitted with 2 Colours, depending on the interior, Beige (CAPPUCCINO), or light Grey (LUNA MIST). Finally, the Premium Sound system is a Double Din Deck, and had features including CD Stacker control, Digital Signal Processor, Bass Harmonic Synthesizer, Digital Audio Compression, Digital Position Control, a 200Watt Amplifier, 8" Subwoofer, mounted on the parcel tray, and tweeters mounted on the instrument crash pad. I have placed this information here, under the presumption that if a Premium Deck has been sourced and fitted, that no instruction Manual will be available with it. LOUDNESS CONTROL - When the volume of the sound is in the low to medium range, the sound quality can be enhanced by pressing the LOUD button. This feature is available in Radio, tape, or CD modes. When selected, "LOUD" is displayed. Push again to cancel function. AUDIO MODE CONTROL - Bass, Treble, and sound distribution can be altered using this control. Each press of the MODE Button (Directly below the volume control knob) selects the mode to be changed (bass, treble, fader and balance). Select the mode to be adjusted and rotate the knob to achieve the effects described. Press and hold the knob for 2 seconds to return the levels of effect to the default setting. The selected mode is shown on the display. CD PLAYER OPERATION - The C.D. Player is located in the luggage compartment. LOADING DISCS IN TO THE DISC MAGAZINE - Load C.D. 's in to the disc magazine slots (1 to 6) one at a time, with the labelled surfaces upward, starting with position 1. 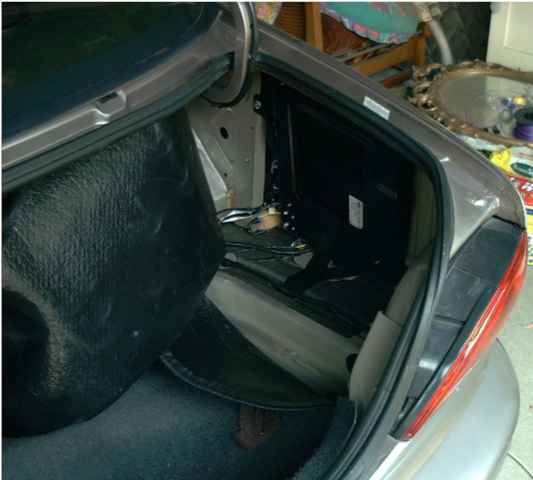 LOADING A DISC MAGAZINE IN TO THE CD CHANGER UNIT - Open the boot lid, to gain access to the C.D. Changer. Slide the protective cover to the right, exposing the magazine slot. Insert the loaded disc magazine in to the chamber unit with the arrow on top of the disc magazine pointing toward the changer. Make sure the magazine is fully inserted in to the chamber. Close the door by sliding it to the left. UNLOADING A DISC MAGAZINE - Slide the protective cover to the right to expose the magazine and the magazine eject button. Press the EJECT Button. Wait for the changer to reload the Discs in to the magazine. The magazine will partially eject. Remove the Disc magazine. UNLOADING DISCS FROM THE MAGAZINE - Push the corresponding white notched lever on the corner of the disc magazine (Numbered 1 to 6), to eject the disc. NORMAL CD PLAY - When the CD button is pressed in another mode, CD Play restarts from the last track played. When the CD Button is pressed when the power is switched off, the power is automatically switched on, and the CD play resumes from the last track played. CHANGING TRACKS - When the CD is in play mode, press the TR up and Down arrow buttons for less than half a second, to seek forward or backward to the next/previous track on the current disc. If the button is held for longer than half a second, then the track will fast forward, or rewind. CHANGING DISCS - When in the CD Mode, you can change discs by pressing the DISC UP and DOWN Arrow buttons. Play will begin on the first track, of the selected Disc. REPEAT (RPT) - When the RPT button is pressed during play, the track being played will be repeated. "REPEAT" is displayed. To Cancel repeat, press RPT until the display no longer reads REPEAT. Whole Discs can be repeated by pressing the RPT Button, until the display illuminates DISC REPEAT. SCANNING (SCN) - When selected, this function plays the first 10 seconds of all tracks of all discs loaded. To activate, press SCN, to De-activate, press the SCN button once more. STUDIO - An intimate atmosphere for "up-close" listening. TO SELECT - Each press of the DSP mode control button changes the mode to STUDIO, HALL, JAZZ, SPACE, or STADIUM. LEVEL OF EFFECTS - The level of the DSP effect can be adjusted by turning the EFFECT knob. NOTE : When changing from tape or radio to CD, the DSP mode will default to STUDIO with a low level of effect. This can then be manually changed to the desired setting. - If the DSP button is kept pressed for a period of more than 2 seconds during CD play, a beep will sound and the current DSP mode and effect level will be memorised for CD playback. BASS HARMONIC SYNTHESISER (BHS) - This function when activated, enhances the bass harmonic providing a different quality of sound. POSITION CONTROL (PST) - This function alters the speaker balance to a choice of three pre-set listening positions. Optimal balance will be at the chosen listening position (drivers seat, front center, or cabin center). To select a position, press the PST button until the desired setting is selected. COMPRESSOR FUNCTION (CMP) - This function reduces the range of volumes heard within a particular track being played. (i.e. it evens out the high and low volumes to an average comfortable volume), and is only available for CD playback. The premium sound system has 5 electrical connectors at the back of the Deck. The CD stacker unit also has one connector. The following diagram gives an idea of where these connectors plug in to the Premium Sound System. 1) Grey / Black - This is the negative (-) speaker line for the Right hand side front speaker, and tweeter (Drivers side). 2) Grey / Dark Green - This is the positive (+) speaker line for the Right hand side front speaker, and tweeter (Drivers side). 3) Blue / Black - This is the negative (-) speaker line for the Left hand side front speaker, and tweeter (Passenger side). 4) Blue / Light Green - This is the positive (+) speaker line for the Left hand side front speaker, and tweeter (Passenger side). 5) Dark Blue / Red - Instrument Cluster Backlight / Dimming circuit (Negative - Signal). This line can be connected to the lines of the same colour, for the Illuminated switches. (This line provides dimmed Button Illumination as controlled by the BEM and dimmer switch). 9) Light Green - Telephone Mute ???? 10) Dark Blue / White - Accessories Power (As taken from the ignition witch, or Cigarette Lighter power). This spade connector is located just below the main wiring plug, and is used to ground (supply Battery Negative (-) Voltage) to the deck. This plug is located on the lower deck, on the right hand side. The function of these wires are unknown, and as such are not discussed here. Document written by: Matti on 30 2002>, Copyright © 2004 Matti, all rights reserved.